Meeting with the author of the book "joy of giving"
Helping gives joy! The next Hospice and Palliative Care Day will be celebrated all over the world in October. Once again, The Hospice Care Association of Częstochowa became involved in a project that would bring the hospice subject to the public. 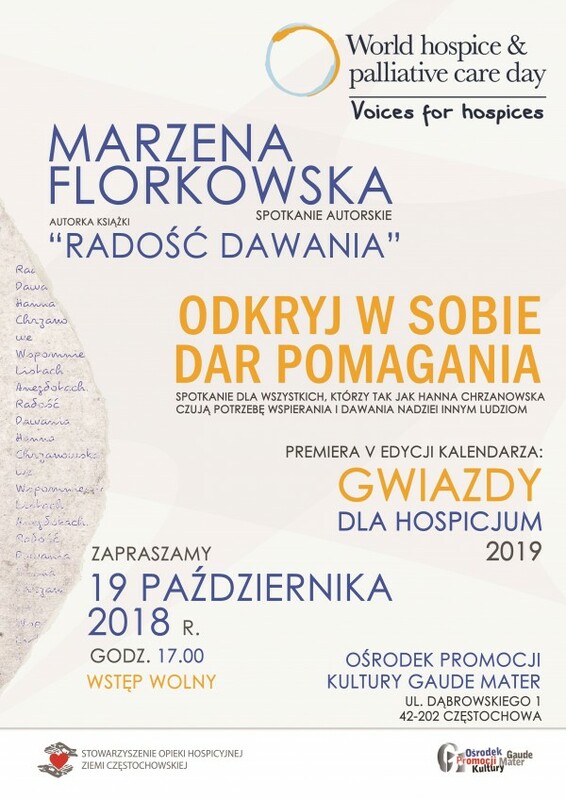 On October 19 at the Częstochowa Gauda Mater Culture Center there will be a meeting with the author of memories about Hanna Chrzanowska, the founder of the first home hospice in Poland and care for the families of chronically ill people. Marzena Florkowska, together with representatives of the Hospice at ul. Krakowska 45a, they will take part in a discussion on palliative care and related issues. "Discover in yourself the joy of helping" is a great opportunity for those who - like a main character of "Joy of giving" - feel the need to support the most needy. And it consists not only in the administration of medicines or help in basic activities. This - as Hanna Chrzanowska claimed, and Marzena Florkowska perfectly captured - also, and perhaps above all: providing them with entertainment, enabling them to learn and work, and friendship and love. We invite everyone who has the need and willingness to help and give hope. On October 19, our calendar for 2019 will also have its premiere. In the fifth edition of the "Stars for the Hospice" we will see well-known and popular faces from the world of sport, music and television entertainment programs.